Josh Colwell, Naim Kapucu, Tison Pugh and Martine Vanryckeghem have been selected for the highest academic award a professor can receive at the university. UCF celebrated faculty, staff and students today at the annual Founders’ Day Honors Convocation. Among the honorees are four Pegasus Professors and three Reach for the Stars recipients along with service awards and other campus achievements. The Pegasus Professor award is the highest academic award a professor can receive at the University of Central Florida. During an entire career at UCF, faculty who are exceptional in every area — teaching, research and service — are recognized for their work. These awards are determined by the president, and recipients receive a $5,000 stipend and a $5,000 research grant. 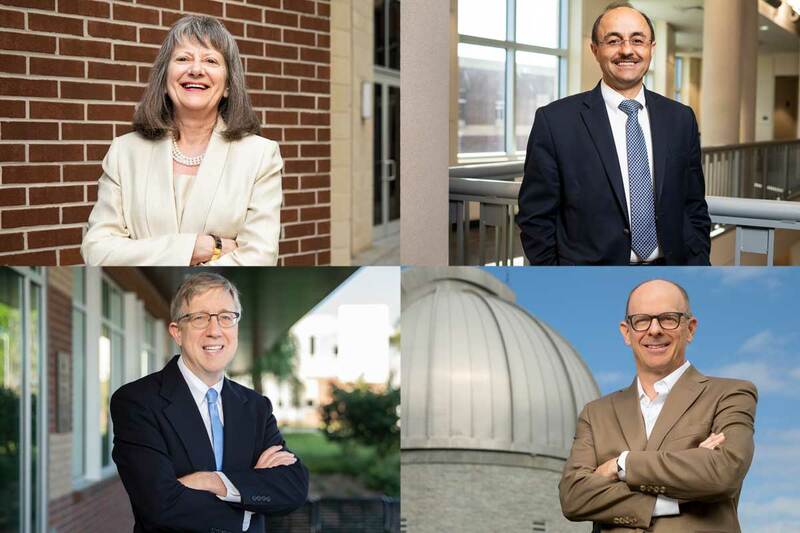 Josh Colwell, Naim Kapucu, Tison Pugh and Martine Vanryckeghem have been selected as the 2019 Pegasus Professors who have impacted students, fellow faculty and the community through their research and dedication to education. Naim Kapucu came to UCF in 2003 fresh off of his doctoral program at the University of Pittsburgh with his dissertation about emergency and crisis management during 9/11. His father wanted him to become a politician and eventually a governor, but he told his father he would one day become “a professor of governors,” specializing in public administration and policy. While his work on 9/11 became well-known, Kapucu planned to never touch emergency-management research again, but the opposite happened after his move to Florida. For the past four years, Kapucu has directed the School of Public Administration. He’s led creation of six new degree programs, including the fully online Masters in Research Administration, and has brought top journals in the field to UCF. Kapucu’s leadership and relationships put the school’s programs on the map. The school has two U.S. News & World Report nationally ranked graduate degree programs: No. 7 emergency management and No. 8 nonprofit management. The Emergency Operations Center at UCF was one of the first in the nation at a university – thanks to a grant that Kapucu helped secure. Tison Pugh is best known among students for his Harry Potter studies class, but that’s not what he’s most proud of. He arrived at UCF in 2001 after receiving his doctorate in English literature from the University of Oregon, and he has also published 19 books in 17 years. Pugh hopes his enthusiasm and love for literature shines through in his teaching, even for any resistant students. He believes the key to keeping students engaged is to tap into their passions. Martine Vanryckeghem began her work in fluency disorders in Belgium, which has shaped her international career. A fluency disorder involves the interruption in the flow of speaking, and the most common one is stuttering. Vanryckeghem is an expert in how to diagnose and treat stuttering in children and adults. Her research in fluency disorders has led her to co-author standardized diagnostic tests for children and adults that investigate the emotional, behavioral and cognitive effects stuttering can have on an individual. Her work has been translated, researched and published in 30 different countries. Vanryckeghem credits her late husband with a lot of her success. They met while he was in Belgium giving a workshop. As for her students, Vanryckeghem hopes to make a small impact on their lives through academic and clinical instruction and research. “UCF made me an all-around citizen. I don’t see myself as only an academician or researcher, I see myself as a faculty team member and leader – a UCF ambassador around the world,” she says.